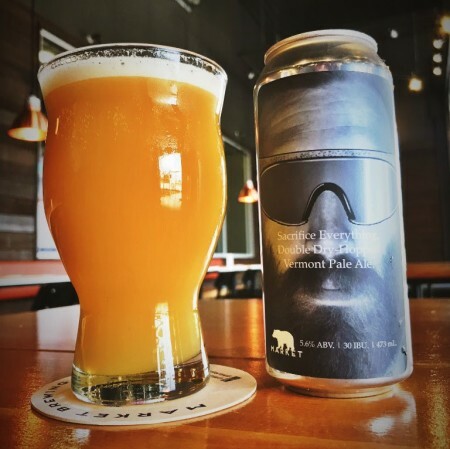 NEWMARKET, ON – Market Brewing has announced the release of a new beer that celebrates the joys of dry-hopping while also giving a nod to the controversial Nike ad campaign featuring Colin Kaepernick. We believe in dry hopping. We pulled out all the stops on this Hazy Double Dry-Hopped Vermont Style Pale Ale. We did a dry hop mid-fermentation, and two post-fermentation, for massive aroma and flavour. Think fresh-squeezed orange juice, stone fruit, melon, and mango. Copious amounts of Ekuanot, Mosaic, and Amarillo hops were used, along with a malt bill of 55% Flaked Oats, for a juicy, hazy flavour bomb. No hops were put into the boil, to keep the bitterness balanced and tame. Best enjoyed as fresh as possible. Sacrifice Everything is available now at Market in 473 ml cans and on tap while supplies last.